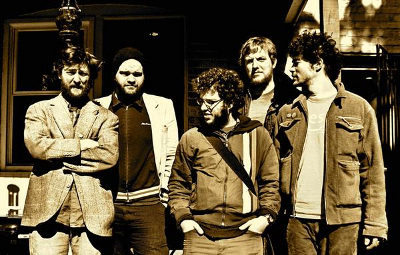 Published on December 10, 2010 in Bands/Artists, Eastern Iowa, Music, Out and About, Personal History, Upcoming Show and Vinyl. 0 Comments Tags: Bo Ramsey, Constie Brown, Iowa City, Iris DeMent, Pieta Brown, Sonya Naumann, Stan Crocker, The Mill Restaurant, The Vagabonds, The Wandering Bears, This Land Is Your Music. 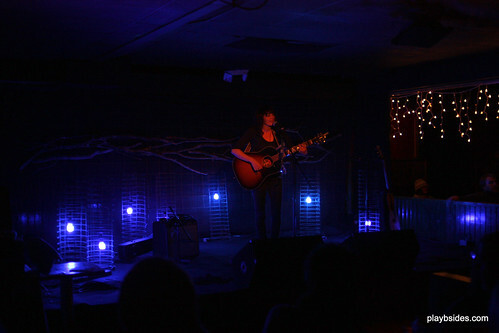 Pieta Brown’s second songwriter-in-residency called “This Land Is Your Music” at The Mill Restaurant kicked off on Saturday 12/4 right on the heels of a six-day mini-tour of Australia which wrapped up the previous Saturday. I had been looking forward to seeing these two shows. Last year’s three consecutive Thursday night shows in November (read my reviews for 11/5/09, 11/12/09, 11/19/09) were truly magical, intimate shows. 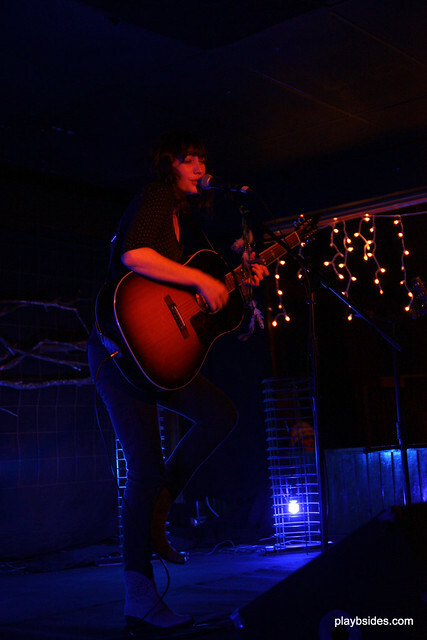 Pieta considers The Mill her home venue– she got her start playing The Mill, so she was happy to bring these shows to that stage. The combination of music and art is a way for Pieta to give back to the community that spawned her career. 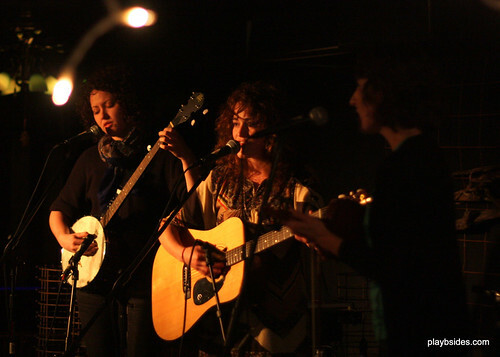 The opening band was the folk trio The Vagabonds which includes Sam Blickhan from The Mayflies. 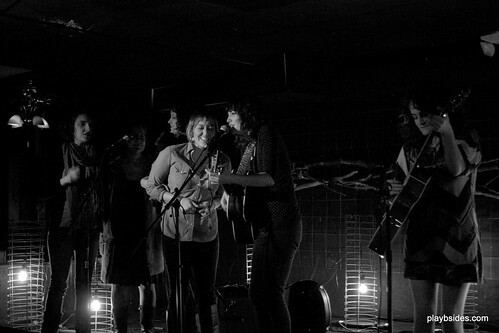 Sam is also in The Wandering Bears with Sarah Mannix of the Vagabonds. Their set was very good, pretty three-part-harmonies of original songs with the occasional cover– one of which was a Be Good Tanyas song. I really liked their original songs and am looking forward to being able to see them again. Like last year, set and light design was done by Stan Crocker. Last year the stage was lit like a small living room with umbrellas and lamps– this year Stan washed the stage in dramatic blue light. Pieta’s set was a solo acoustic set and included primarily songs from her new album One and All, the Shimmer EP and Remember the Sun, but she also added some new songs. “Be With You” had only been played one other time according to Pieta. The song “No Words Now” was described as being influenced by meeting Mark Knopfler (whom she toured with this year) and JJ Cale, who are both heroes of Pieta’s (as is Tom Petty— the subject of “Faller”). As with the first This Land Is Your Music shows, there was an artist gallery. Lighting designer Stan Crocker had a really cool installation of light boxes in the green room. Each of the parts of the display had its own light source and illuminated individual subjects. 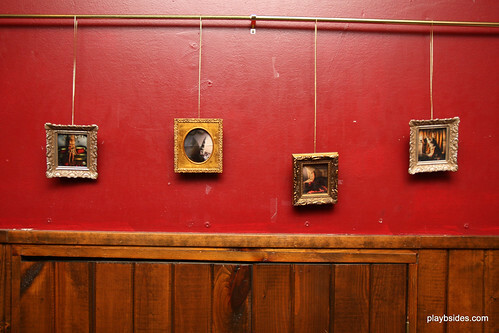 The entryway of the Mill had photos from regional photographer Sonya Naumann. Here is a set from her series titled “Dunce”. The This Land is Your Music shows are something anyone who is a fan of Pieta Brown or the Eastern Iowa music scene in general should really get out to see. I’m really happy that Pieta was able to pull this off again this year and am looking forward to seeing tomorrow night’s show. 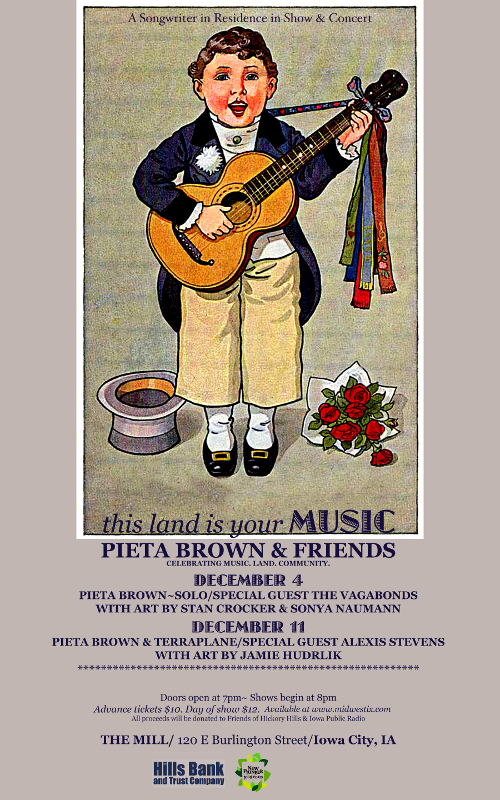 Pieta will be playing in a trio with Bo Ramsey and a drummer and the opening act will be Alexis Stevens. The gallery will be provided by Jamie Hudrlik. The tickets are $10 in advance and $12 at the door and the proceeds will again be donated to Friends of Hickory Hills and Iowa Public Radio. Pieta’s sister Zoe designed teeshirts for the event as well as the poster seen above and both will be available at the show along with Pieta’s new vinyl for One and All! Click Here for the Mill Restaurant Website for more details. The Time to play b-sides archives for the the-vagabonds tag.